Prof. Saavedra leads the WMSU employees in a calorie-burning dance exercise routine. In compliance with the Civil Service Commission (CSC) Memorandum Circular No. 8, Series of 2011, Western Mindanao State University started with the physical fitness program for its administrative and non-teaching personnel. 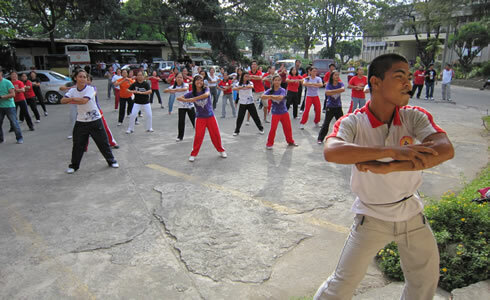 The program, dubbed as ‘Hataw’, was participated by the employees last Friday at the university’s carpark. CSC as the central personnel agency reiterated the program, requiring all agencies to adopt “The Great Filipino Workout” as an integral part of the National Physical Fitness and Sports Development Program for government personnel. The memorandum circular reiterates the allotment of reasonable time for regular physical fitness exercise and inclusion of physical fitness exercises in seminars, training programs and similar occasions. Looking sporty in their shirts and sweat pants, WMSU employees grooved to the beat of feel-good music. Prof. Nathaniel Saavedra of the university’s College of Physical Education, Recreation and Sports (CPERS) led the employees in performing a calorie-burning dance exercise.